As discussed in the previous post (here), the markets have completely discounted the stellar US payrolls report when projecting the Fed's policy path in 2016. Futures-implied probability of 4 rate hikes (or higher) is only 6.5%. Why is the market so "dovish" relative to the FOMC? 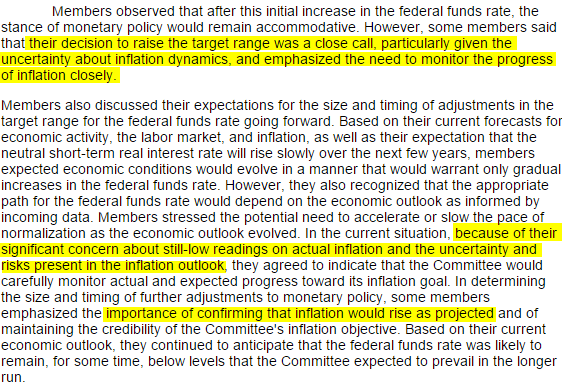 As a backdrop, we now know from the FOMC minutes that the Committee members were quite jittery about disinflationary pressures, with many being ambivalent in their decision to raise rates in December. Is the long-awaited jump in inflation about to make itself visible? Market participants remain skeptical. Here are some key reasons. 1. Most analysts have been forecasting - for some time now - a significant increase in US wages as the labor markets tighten. However thus far we have seen little evidence for this "acceleration", with wages persistently growing below 2.5% per year. 2. With US crude oil prices below $33/bbl, many believe the energy impact on inflation is yet to be fully reflected in the official figures. Moreover, some think that weak energy prices will even partially bleed into the core PCE inflation measure (on a delayed basis). 3. China's ongoing devaluation will continue putting pressure on prices in the US as well. 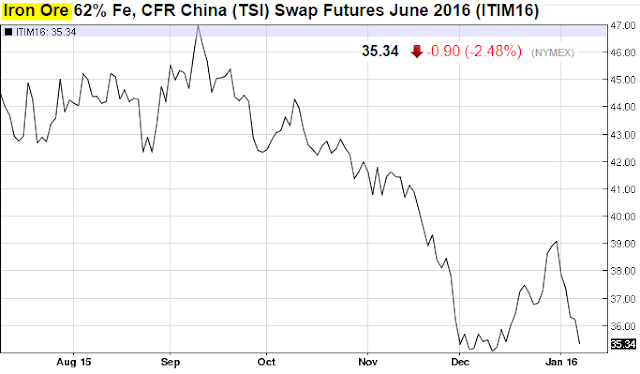 As an example, the December jump in iron ore prices has been nearly fully reversed as China-related worries returned. In addition to China's impact on commodities, most expect US import prices to fall further, also igniting disinflationary concerns. 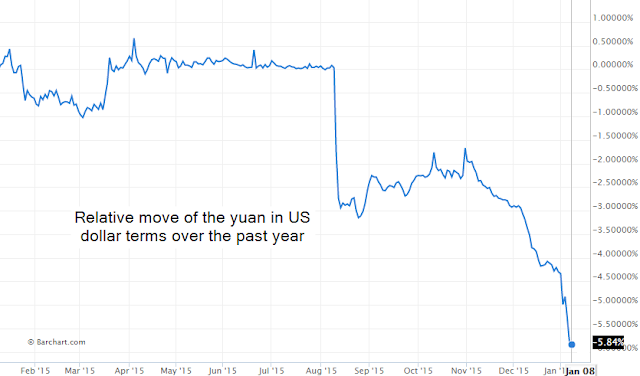 Of greater concern is whether China will continue devaluing the yuan further in order to stimulate its export sector. This could lead to "competitive devaluations" - or what some refer to "escalation of currency wars". Here is a quote from Mexico's finance minister. FT: - “There is real concern that, in the face of the deceleration of the Chinese economy, the public policy response will be to start a round of competitive devaluations,” said Luis Videgaray, finance minister. He called that prospect “frankly perverse” because copycat devaluations would leave everyone in the same position and would not really alter anything. Mexico’s peso floats freely, but the central bank has been auctioning dollars in recent months to shore up the currency. Such an outcome will be highly deflationary, resulting not only in further weakness in commodity markets and US import prices but also in a wave of shifting production and services offshore. 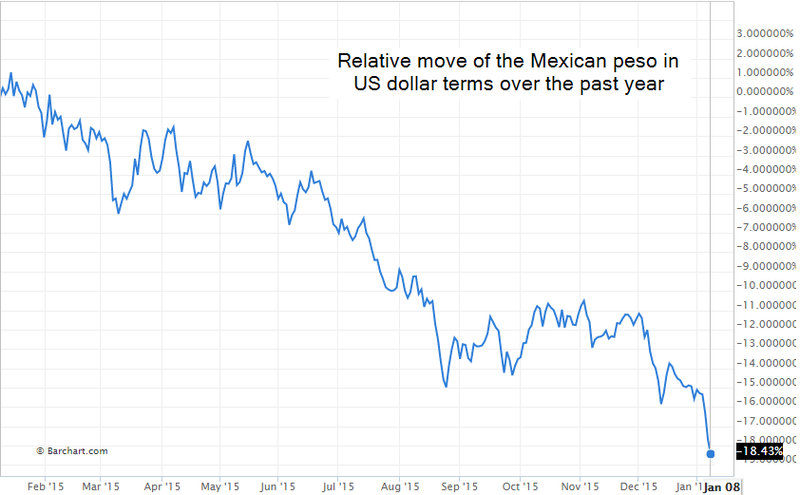 Consider the fact that just over the past year the Mexican peso is down 18% - now at the weakest level on record. Shifting production and even some services out of the US becomes increasingly compelling. In fact the trade-weighted US dollar index is now at the highest level since 2003 and "offshoring 2.0" could be the next major trend for US businesses. This of course doesn't bode well for stronger wage growth. 4. 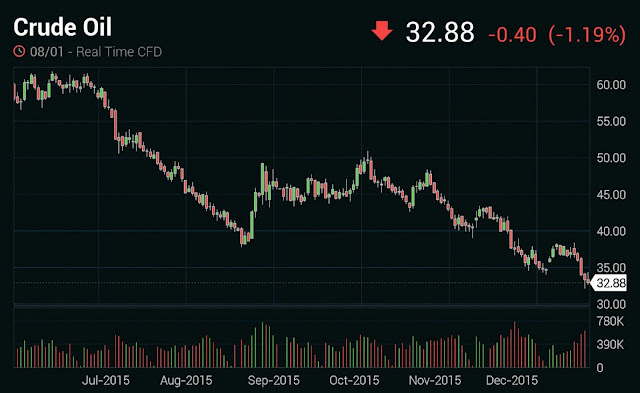 We've already seen some of the impact of this dollar strength in the struggling US manufacturing sector. Growth in US services sector is moderating as well (see summary). Does it make sense to hike rates aggressively in such an environment? 5. Given some of the trends above, market-based inflation expectations remain near the lowest levels since the Great Recession. While a number of analysts as well as many Fed officials view this as a "transient" effect, these measures have remained stubbornly low for some time now. 6. Finally, a number of economists are becoming concerned about aggressive rate hikes at a time when the corporate sector is about to undergo deleveraging. 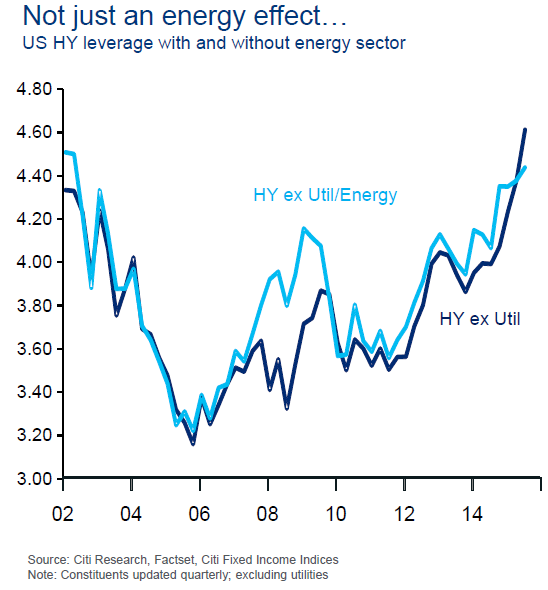 Of course we know that all the years of highly accommodative monetary policy in fact caused corporate leverage to rise to begin with (see post from 2014). 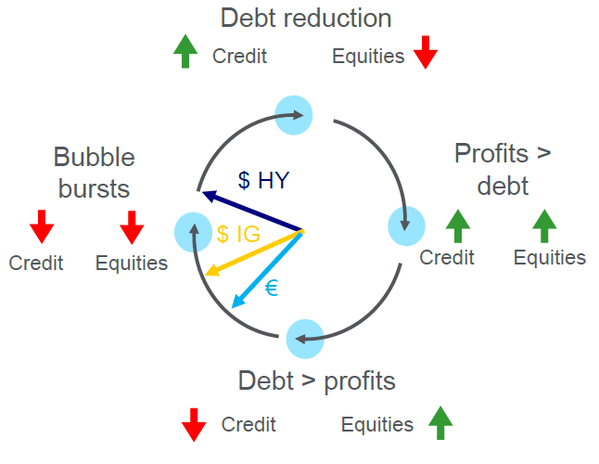 Nevertheless, with a number of analysts calling the end of the credit cycle, managing this deleveraging process should become a consideration for the Fed this year. These are some of the key reasons markets view four or even three rate hikes as being off the table for 2016. Some are even calling for the Fed to take rates back to the 0-25bp level. It's unlikely the FOMC would do this because such an action would damage the central bank's credibility. Nevertheless some are hoping the Fed would pay more attention to what the ECB is currently doing.